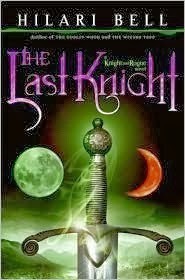 The Last Knight is the first book in the Knight and Rogue series by Hilari Bell. Available at Amazon and Barnes and Noble. Two character points of view between Sir Michael, a knight errant, and his squire, Fisk, who is also a con man. We get just enough of each character to know that there is more to both their stories. I had problems keeping the narrators straight and had to backtrack occasionally to check, which was frustrating but helped show how the two characters are rubbing off on each other. The world itself is doled out in tantalizing pieces - as with the characters, we get just enough to know that there's more to the story. The plot itself is simple but it made me ask 'why' a lot and I expect the following books in the series to answer those questions.